Olot Country House – House for sale in Olot, Girona, country house in need of restoration, it has electricity, water and telephone. Within 4 minutes drive of Olot, with two restored barns as housing. Land of 11 hectares, 4 hectares of crops and other magnificent forests of beech, oak, and Catano. The big house on the ground floor the old stables that can be restored and has large rooms. The housing before has 5 bedrooms, now has just the roof with original beams and thermal insulation. Olot is in Catalonia, in the Girona province. Price: 510,000 euro. Empuriabrava House for Sale – Property for sale in Empuriabrava, Girona, Costa Brava, Spain. Terraced house offered for sale in the Puigmal area of Empuriabrava, with an area of 68 square metres this Empuriabrava house offers 3 bedrooms, 2 bathrooms, kitchen, a dining room, terrace, solarium for enjoying the sunny weather and outdoor parking. Empuriabrava is a coastal resort which is close to the town of Roses on the Costa Brava. The asking price for this house in Empuriabrava is 195,000 euros, a customized mortgage would be 723 euro per month. Benicarlo Apartment Costa del Azahar – Property for sale on the Costa del Azahar. Two bedroom apartment for sale in Benicarlo, located opposite the fishing port and the town square. The house has two double bedrooms both with fitted wardrobes, a bathroom, a bathroom with whirlpool, living room with open kitchen, rather large terrace and a closet in the hall. 3rd floor, 60m2, furnished. The finishings are excellent with porcelain tile flooring, air conditioning / heating fully installed, security door, video intercom and much more. Benicarlo is a coastal town on the Costa del Azahar, Spain, it enjoys fine weather conditions and is popular as a tourist resort. The price of this apartment in Benicarlo: 155,000 euro. Torrevieja Apartments – We have just added another new apartments page on our holiday apartments website, this time for the town of Torrevieja on the Costa Blanca, Spain. Among the offering is a delightful two bedroom apartment which is front line to the sea on the ever popular Los Locos beach (Playa Los Locos) at the northern end of the town. 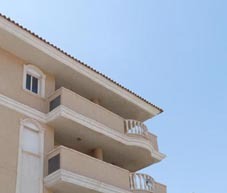 To view this and our other Torrevieja apartments click here: Torrevieja Apartments. Torrevieja is to the south of Alicante in the Comunidad de Valencia. If you are looking for property to buy in Torrevieja then you can always check out our Torrevieja property site here: Torrevieja Property. You can also click on the Torrevieja “tag” on this page for all our postings in Torrevieja. View a map of Ayamonte, Spain here: Ayamonte Spain Map. Zeniamar Holiday Apartment – 3 bedroom upper duplex apartment currently available for holiday rentals on the popular Zeniamar urbanization in Playa Flamenca on the Orihuela Costa, Spain. Offering 3 bedrooms, 2 bathrooms, american style open plan kitchen, sitting/dining room, big sunny solarium with shower for cooling down, communal swimming pool and garden areas, and gymnasium. This apartment in Zeniamar is available for holidays and also for long-term rentals, with holidays from 275 euro per week. Cabo Roig Apartment for Sale – Third floor two bedroom apartment with sea views on offer in Cabo Roig, Costa Blanca, Spain. Spacious apartment with sea views from the lounge and balcony is in a desirable location on the sea-side of the main road, in the safe, gated community of Aldeas de Aguamarina 1. Offered for sale fully furnished and equipped this apartment would be a good purchase for a holiday home in a great spot. The apartment would be very easy to rent, as this is a renowned holiday location. The only slight disadvantage is that it is north facing, which means it would be a little chilly in the winter, but on the reverse of this is that the apartment is a bit cooler during the scorching hot summer months, when the weather is really hot. The current asking price for this Cabo Roig apartment for sale is 115,000 euro. And get a map of Cabo Roig here: Map of Cabo Roig Spain.